Dig underneath the highly unassuming and somehow typically British reserve of the name “The David Rhodes Band” and you will find three musicians with highly impressive CVs. Guitarist David Rhodes is most well known for his long association with Peter Gabriel, and indeed this album was recorded at Gabriel’s Real World Studios. He has also played with artists as diverse as Kate Bush, Paul McCartney, Talk Talk, and Scott Walker. In a characteristically self-effacing manner, he says “I sing and play in this band”. Bass guitarist Charlie Jones has a CV that lists playing for Robert Plant, Siouxsie Sioux, and Goldfrapp, and working as a composer with Plant and Alison Krauss on Raising Sand, picking up a Grammy along the way. Not to be outdone, drummer Ged Lynch also has a long association with Peter Gabriel, and has worked with David Sylvian, Tom Jones, Seth Lakeman, The Charlatans, and many others. This self-titled album is the band’s second, following 2010’s Bittersweet, and was originally released in October last year. Normally, we here at TPA Towers do not review albums so long after release date, but this consummately skilled mix of rock and pop, seasoned by a healthy shake of quirkiness here and there is well worth a listen. That and the fact the review copy only came my way back in April, making it “new” to me, at any rate. The reason I remembered the album is that David Rhodes contributed to Tim Bowness’s fab new waxing, and seeing the name brought me back here. Opening in an atypically plaintive and understated fashion, Be Mine initially sounds like it wouldn’t be out of place on a James Blunt album, until David lets rip with his gritty guitar soloing, a great roughhouse amalgam of blues, funk and classic rock trio licks. There are places in Grinding Wheel where his tone is not a million miles from Rory Gallagher, and in my book praise does not come much higher. Not that this album is all David. The rhythm section is as tight and as sweet as a nut, as you would expect given their experience. Taking Grinding Wheel again, a simple trick of having the bass play on the beat, the drums off the beat and somewhere along the line having the two and the guitar march in unison on the beat, all done with consummate ease, while not being the most difficult exercise is somehow rather satisfying. Especially when your sense of rhythm totters on two left feet, like yours truly! The band’s pop instincts are never far away, and the stomp-along glam beat behind Monkey On My Back will bring a nostalgic smile to those of you old enough to recall falling off your platform boots. The production, by Chris Hughes, and the mix by Tchad Blake are top notch; no-one dies in the compression wars on this record. The resonant bass drum on the slow menace of My Blue Balloon will makes your floorboards rattle! Clever use of echo and reverb in the stadium-sized ballad Ship Of Fools are examples of subtle quirks that remove this album from the aforementioned Blunt territory, that and David’s soaring guitar work on this track and throughout. All the songs are David’s and he loves to roll with a ballad as much as he likes to rock out, making the album a nice set of contrasts. Waggle Dance, unsurprisingly not named after the half-decent bottle of ale, cheekily references Bowie’s Fame, but there are far worse influences to wear on one’s sleeve. This is the kind of effortless rock-funk this trio do so well, and several rugs are cut as the tune shimmies and sashays along, shaking an extravagant tailfeather or two in the process. 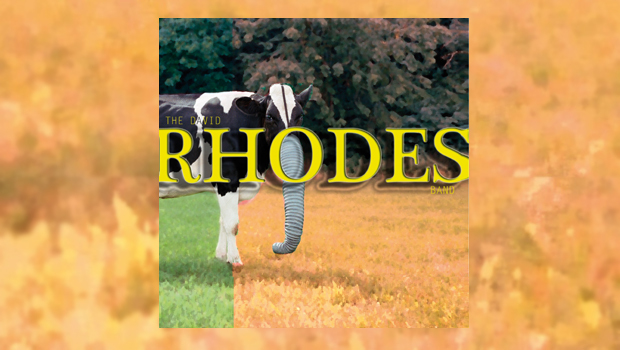 While not blazing any trails, The David Rhodes Band is an enjoyable 42 minutes of pop-rock played by highly skilled musicians who obviously had a whole lot of fun making the album, which was done quickly, David’s songs arriving fully formed to be knocked into shape by the trio and Chris Hughes in the studio with as few overdubs as possible. The “live” feel transmits well through the zeros and ones, and this record makes a nice change from the wilfully difficult music I sometimes get lost in. A veritable sorbet for the ears, no less!